The Metaphysics of "Double or Nothing" Warning: this page contains info about episodes up through season 3 BtVS/season 3 AtS. If you're in danger of being spoiled, proceed with caution. Skench demons: An elderly demon couple have a Skench demon in their lair. Skenches take over your house and shriek all night. And they aren't impish. If you want to kill one, you have to cut off its head. But watch out for the projectile phlegm. The Shiv-Roth is the Pylean vigil for the bereaved. A person supports another who is grieving by spending time with them quietly and unobtrusively, or talking to them and comforting them, whatever is needed. Cordelia engages in this vigil for Angel while Groo minds the store downstairs for her. Souls: What exactly does Gunn owe Jenoff? At some points it is said Gunn owes him his "future", and at others, it is said he owes him his "soul". The "soul" in the Buffyverse is for all intents and purposes the moral conscience of an individual. When Jenoff threatens to take Angel's soul, Angel worries about being turned back into Angelus, an evil vampire. What does this mean in Gunn's case? It is unclear if human beings can exist as humans in the Buffyverse without a soul. The one example we have of a living human who allegedly had no soul was the sociopath Ryan Anderson. However, the claim that he had no soul was made by a demon, and may have only been metaphorical. If in fact the thing that Jenoff is taking isn't the conscience, it might instead be the life force of a person--the energy that keeps them alive. Jenoff's process of extracting the "soul" isn't much different from Kathy in "Living Conditions". Kathy drew Buffy's "soul" out through her mouth, and it appeared as a stream of light. Jenoff pokes his fingers in the eyes of the victim and extracts the "soul" (appearing as a stream of light) through the eye sockets. It is unclear if Kathy's soul-suckage would have killed Buffy, but when Jenoff is done with a human victim, they are very dead. This is what is meant by Gunn owing Jenoff his "future", then. When Gunn started planning a future with Fred, Gunn essentially broke the contract he had made to sell his soul and die. So Jenoff called in Gunn's marker to remind Gunn that he had no future. The Akashic records: Jenoff discovers Gunn's intention to spend his future with Fred from something called "the Akashic records". The Akashic records are a sort of mystic filing system said to record every thought, word, and action that has ever occurred in the universe. They are also said to be that thing that make clairvoyance and psychic knowledge possible. Evil in "Double or Nothing"
Demon casinos: L.A.'s got it all--demon drug dealers, the wizard Mafia, and illegal gambling run by Jenoff, a demon crime boss. Jenoff's game is exploiting the greed and desperation of human and demon alike. They either come to him to get things they want or need directly--i.e., in exchange for their souls, or they lose their lives to him slowly, by racking up huge gambling debts. Unanswered question: When Jenoff's lackey arrives at Angel Investigations looking for Gunn, he gives Groo Jenoff's card. Not a smart move, it would seem, if Jenoff wants to take possession of Gunn's soul clear and clean. It is possible, however, that Jenoff wants the friends and relatives of his victims to try to save their loved ones. This gives him the opportunity to rope in a few more victims when they desperately try to bargain for their loved one's life. Fortunately, Angel wasn't really in a bargaining mood. Moral Ambiguity in "Double or Nothing"
"Back in the day, this truck kept me alive. Helped save a lot of other lives, too. ...I didn't think a soul was that big a deal. Didn't think I had a future then." At the age of 17, Charles Gunn already had a reputation as a fighter and defender of the innocent on the streets of L.A. But that life seemed hard and short to him. He saw no hope for the future, only hope for the present day. He went to a Casino back room to make a deal with Jenoff, a demon crime boss. He wanted to trade his future for a weapon--a truck to use in his fight against the vampires in his neighborhood. It seemed a reasonable trade to him at the time. He sealed the agreement in his own blood. [P]eople can't figure out why someone would sell their soul for a truck. In a society where kids of seventeen are killing each other over things of less monetary value I can understand it. Gunn had nothing, except a mission to protect what was his, that truck was an instrument that helped in that process.... I see it as one persons treasure is another mans junk. Gunn treasured the truck for what it could contribute to group survival (Rufus, 23 Apr 2002 7:49). Years later, things have changed. Gunn has the great job and the great girl. When Jenoff sends one of his lackeys after Gunn to collect, Gunn hesitates. He doesn't want to die anymore. But they have threatened to kill Fred if he runs. Gunn is prepared to live up to his bargain. He breaks up with Fred rather nastily so that the bad guys will know she is not his collateral. Then he goes to Jenoff's to pay his bill. Angel comes to Gunn's rescue by enticing Jenoff with a deal: They play a game of Angel's choosing. If Angel wins, Gunn goes free. If Jenoff wins, he gets the souls of both Angel and Gunn. Cordelia appears to interpret Angel's proposal as a stall tactic, and though Angel tells her it isn't, it is. Angel's only goal is to avoid a fight that might cause him to lose more of his family. Winning the card game is immaterial to him. He gives Cordelia a stake and tells her that she knows what to do if he loses. And she does. Angel and Jenoff play the game--a simple cut of the deck, high card wins. Angel loses. Cordelia disables Jenoff by stabbing him in the hand with a stake. Then Angel chops his head off. Gunn is dismayed--Jenoff isn't that easily killed. The demon crime boss starts growing a new head. Rather than throwing the Angel Investigations team into a fight, though, Angel asks if anyone else in the casino owes Jenoff money. Then he and his friends leave. The casino patrons push in to attack Jenoff themselves. Jenoff had power because he had an organization. He rules his organization through fear and a system of obligations. Now, every person (or demon) in his organization wants him dead, whether they can ever achieve it or not. ...no one said that Jenoff couldn't be killed, only that it wasn't easy. In the context of an protective organization, that toughness becomes an impossibility. Now that the organization is gone, it is just one tough demon against the world. Some one will find a way to kill him permanently. Too many people want him dead (Robert, 4/23/02 11:34). Angel's solution to Gunn's problem is much more dishonest and timid than what we've come to expect from a champion like Angel. But it should not be surprising. Since Connor was taken, Angel has been at various times desperate, angry, and depressed--all signs of grief, none signs of clear thinking. It will take a lot more than a few weeks and a Shiv-Roth before Angel is ready to be a true champion again. What is next for Wesley? When Fred visits Wesley in the hospital, she makes it clear that she believes what he did was wrong, and that he is in danger if he returns to Angel Investigations. She tells him that all of his efforts to save Connor were for nothing. When Wesley is released from the hospital he goes home to his apartment alone. Good in and the Metaphysics of "The Price"
The unintended consequences of magic: You can't mess with dark magics and expect to walk away. There is almost always a cosmic price for tapping into the primordial powers of the universe. For Willow and the Sunnydale gang, this consequence came in the form of thaumogenesis, a creature or creatures brought into being as a result of a spell. Contrary to Angel's suggestion, however, the Sluks that attack the hotel aren't a case of thaumogenesis. They did appear as a by-product of Angel's ritual to incarnate Sahjhan, but they weren't created by it. The Sluks originated in Quortoth. The real consequence to Angel's spell, therefore, was to create tiny cracks in the dimensional walls between Earth and Quortoth. This may have happened during the brief moment Sahjhan began to appear inside the pentagram Angel intended to trap him in before he disappeared and reappeared miles away. Opening and closing a rift to Quortoth was the last spell the powerful demon sorcerer performed, and remnants of that magic might have still been in his demon essence. Sluks are translucent (almost invisible), tentacled, slug-like creatures that glow in the dark and are perpetually thirsty. They clamp onto the face of a victim and force their way into the body through the mouth. There, they slowly absorb all the moisture in the victim's body. This drives the victim to drink everything in sight, but it is only a matter of time before the victim dies of complete dehydration. Removing a Sluk: When Fred becomes infested with a Sluk, Gunn goes to the one expert he knows on supernatural trouble--Wesley. He tells Wesley about the Sluks, and Wesley gives him a bottle of alcohol. Since alcohol has a dehydrating effect on the body, Wesley is betting the thirsty Sluk will find it unpleasant and won't want to stay. Groo and Lorne lay Fred out on the steps of the hotel. Gunn forces Fred to drink the liquor. Fred coughs and spits out the Sluk. De-infesting the hotel: What does it take to destroy a massive bio-plasmic infestation of beings that are almost impossible to kill? Well you could call in a shaman exterminator. Or you could discover a new demonic power you didn't know you had. When Cordelia and Angel take on the Sluks, one of them lands on Cordy's hand. She holds the Sluk away from her. Suddenly, a bright white light illuminates her from inside. The glow becomes brighter and brighter until it shoots out of her body, obliterating the Sluks. The destroyer: The Sluk inside Fred warns Angel about the coming of "the destroyer", a being who is after Angel. After the Sluks are killed, a large demon comes through the dimensional cracks above the pentagram in the lobby. But the demon isn't the "destroyer". Shortly after it appears, a teen-aged Connor jumps through the cracks and slays the demon. Then he aims an anti-vampire weapon at Angel. The Sluks' central desire is to live and drink. But in order to get access to new sources of liquid, they must infect hosts who can help them spread. This makes them parasites. And like many other Buffyverse parasites, they represent evil-as-order, imposing their will on their hosts, then leaving them for dead. Lilah improved her standing at Wolfram and Hart by helping Angel during his dark days of vengeance following Connor's disappearance. After all, Wolfram and Hart want Angel dark, not dead. Now Angel's hotel has become infected, and Gavin sees an opportunity to take Lilah back down a notch. He's learned quickly that the key to survival at Wolfram and Hart is "every lawyer for him/herself". He's also learned the key to manipulating Lilah: her weakness is her insecurity about maintaining her power and position. Gavin soon has Lilah turning cartwheels helping an enemy of the firm who may never become an ally. Moral Ambiguity in "The Price"
Cordelia scolds Angel for doing dark magics to get his son back instead of contacting her. Indications are that Cordelia has visions relevant to the place where she is at. She could have come back to L.A. and got a vision that would have been helpful to Angel. Angel doesn't deny responsibility for what is now happening so much as rationalize it with his own desperation at the time he was searching for Connor. But desperation that arises from his own guilt seems to be a theme for him. In his new desperation to disinfect the hotel, he gets rough with an infected Fred, denying her water when she is quickly dehydrating. Fred isn't comfortable with the way Wesley has been cut out of Angel Investigations, and not just because she has a hard time filling his research shoes. But her suggestion to enlist Wesley in Sluk research doesn't past muster with Gunn. His interests are clearly in keeping Angel from doing anything rash--like say, murder or assault. Cordelia tells Fred that even though she has been friends with both Wesley and Angel, it's Angel's feelings she cares about now. The most significant changes in her life in the past few years have been tied to Angel--her decision to team up with Angel in L.A., the visions that guided his mission, and her choice to become part demon to keep the visions. Although getting the visions in the first place wasn't voluntary, everything else has been. Some of this is due to Cordelia's evolution as a person, her desire to fight for good. But is all of it due to this? Has Cordelia's self-image become a little too closely tied to her role as vision-girl? When Groo overhears Cordelia tell Fred how important Angel is to her, he begins to realize that Angel is even more important to her than he is. To Cordelia, Groo is a "loyal puppy dog." Can he be anything more? Wesley isn't any more interested in seeing the Angel Investigations team then they are in seeing him. He fought for life in order to be with his friends and explain himself to them, but his new life consisted of attempted murder and abandonment. The life he knew, his place in the world, his family--everything is gone. He is willing to extend a hand to the woman he loved and the one person who showed concern for him, Fred, but that's as far as he'll go. The Metaphysics of "A New World"
Connor isn't just human, he is the human child of two vampires. This gives him human physiology, but the speed, strength (and smelling and hearing) of a vampire. He also has the fighting skills of someone who's spent seventeen years in a hell dimension. Connor finds his way to Earth by following the Sluks through the cracks in the dimensional walls. He lands in the Hyperion lobby and tries to stake Angel, then fights off a defensive assault from Angel, Gunn and Groo. Dimension hopping: As Groo and Cordelia stand guard over over the dimensional rift to Quortoth, it discharges again and throws them to the ground unconscious. Fred discovers that the Quortoth demon Connor killed usually has a mate. The gang fears that it has come through the rift. But what came out is a very different threat. Time and dimensions: Only weeks ago, Holtz disappeared into Quortoth with the infant Connor. Now Connor is a teenager. How is that possible? Because time passes at different rates in different dimensions. Objectively, time in Quortoth passes considerably more quickly than it does on Earth (like Ken's dimension in "Anne"). Seventeen subjective years can pass in Quortoth while only a few subjective weeks have passed on Earth. She pulls out a few ingredients and flings them towards the crack. They rise into the air and seal the fissures. Demons: When Pylean Burbeasts eat their fill, they will couple with anything that moves. Your best bet? Don't move. Moral Ambiguity in "A New World"
Connor has returned to Earth to find his biological father and kill him. But things aren't so simple, even for Connor. He believes Angel is evil, but he is also curious about the vampire that helped give him life. When Connor's first attempt to kill Angel is thwarted, Connor runs. He befriends a young junkie, Sunny, while saving her from a drug dealer, Tyke. He fights off Tyke's gang and starts to kill Tyke, but Sunny stops him. Connor takes Tyke's ear as a trophy instead. Sunny leads Connor to an abandoned apartment complex where she sometimes stays. There, he sees the good side of Earth--kisses and chocolate--and the bad, the death of a friend by an overdose. Angel: Connor was raised on stories about Angel(us) and Darla, the demons who killed his "father" Holtz' family. But the Angel Connor meets isn't what the boy expects. His vampire father worries that Connor has taken heroin and defends Connor against the drug dealers, including taking a bullet from a police shotgun for him. When Connor wants to kill Tyke for killing Sunny, Angel wants to keep him out of trouble. When Tyke grabs Connor as a hostage, Angel begs to be put in Connor's place. Angel is a vampire--he has the face--but he is also very human, trying to connect to Connor in his awkward-Angel way. After they escape the bad guys, Angel invites his son to come back to the hotel. But Connor takes off in the other direction, and comes upon the only father he ever knew--Holtz. Unanswered question: How did Connor know that Holtz would be there? Connor has a keen vampire-like sense of smell, and he knows his father's scent. He can track Holtz over a range of miles. Groo has already picked up on how much Cordelia talks about Angel. And even though Cordelia claims it's because Angel has needed her support as a friend and colleague lately, Groo is clearly jealous of Cordelia's constant deference to Angel. Fred once again wants to seek Wesley's help, but Gunn tells her that Wesley made it clear they shouldn't come see him anymore. Wesley gets a visit from Lilah. She is there to play on his feelings of rage and abandonment and to recruit him into Wolfram and Hart. If he gives them his inside knowledge of Angel Investigations, he will receive unlimited access to their scholarly resources and a great benefits package. Lilah gives him a copy of Dantes' Inferno. She tells Wesley that like Judas Iscariot, the disciple who betrayed Christ, Wesley he is a betrayer, and therefore not as good a man as he thinks he is. Lilah gave Wesley the Inferno, but the correct metaphor is purgatory. In Dante's cosmology, Wesley wouldn't go to Hell, see he made his mistake out of good intentions. He was, after all, trying to protect Angel. But Dante would put Wesley in Purgatory.... He is suffering and atoning and so forth. Also, both Wesley and Dante have been driven from their friends and are forced to live in exile. Both contemplate how cruel the world is (jpc, 5/08/02 11:59). Lilah gave him precisely the one she intended. Regardless of where Dante would have placed Wes ...Lilah wants Wes to place himself in the Inferno, she wants him to see himself as the lowest of the low. It's a part of the seduction of Wesley's soul (LittleBit, 5/08/02 12:28). Energy: Cedrian crystals are said to contain a millennia of stored energy. But they don't come ready to use. You have to enchant them. Once enchanted, they can be used like an ordinary battery. Fred puts one in a Geiger counter that she intends to use to track whatever came out of the Quortoth fissure after Connor (Steven). Her theory is that anything that came out of Quortoth should emit "para-plasmic radioactivity". Fred gets sharp readings off the point where the fissure opened and off of Steven. Then she and Gunn follow the readings from the Hyperion to a shabby motel where they find Holtz. Cordelia's visions come to her in a very life-like way now, so that she can't tell the difference between a vision and reality while she is having them. She can also "go back into them" and play out the scene again in her head. This enables her to watch Steven and Angel in the night club even though she wasn't there. Cordelia's demon powers are, so far, unpredictable and not entirely under her control. They seem to happen spontaneously when she is in danger. When Steven attacks Cordelia with a knife, the white light comes out of her face again and disintegrates the weapon. Then she uses the powers to help relieve Steven of his anger and confusion. Lorne comments that Cordelia got "the full package" of powers from the PTB's. But are they truly her "powers", if they aren't entirely voluntary? What was the PTB's intention in giving them to her? Holtz' death: How can a man die of neck wounds without leaving much blood? Wesley is lured to a night club by Lilah. He sees Justine at the bar. Lilah has also lured Justine there with an anonymous tip that the bar would be full of vampires. And it is. Because the vampires were told that Justine the vampire hunter would be there. Lilah wants to see what Wesley will do. Will he try to help the woman who slit his throat? Wesley is indecisive, but he has no interest in witnessing Justine's death. The question is made moot, however, when Angel arrives. 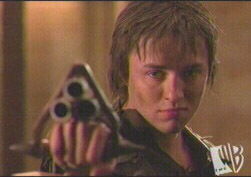 Wesley and Lilah see a teenaged boy with super strength and fighting skills helping Angel kill the vampires. They realize it is Connor. Steven/Connor is on the verge of adulthood, but he still needs a father to help him find his way. He clings to Holtz for advice, and bonds with Angel when they kill the night club vampires. Holtz sees the two of them together and later tells Steven to go be with Angel. Steven questions Holtz' motives and returns to Angel's hotel angry and confused. He takes out his anger on Lorne, calling him a "filthy demon". Then he attacks Cordelia when she says she is part demon. Cordelia explains that demon doesn't always equal evil on Earth, and Angel invites Steven to stay. He tells him that this is the place that Steven belongs. Then Angel goes to go talk to Holtz. Fred and Gunn take Steven to the beach. Steven over hears them talking about where Angel has gone. He rushes to find his fathers. Cordelia warns Angel not to go to Holtz without telling Steven that he's doing so and why. She tells him that he might lose what little trust he and Steven have built. Angel goes anyway. For sixteen years, Holtz raised Steven in the Quortoth dimension, and he has come to love him. Then Steven went to Earth in search of his biological father. Holtz followed. But he is old now, and Steven is young. Holtz has to let him go. He encourages the boy's interest in Angel while warning Steven to be careful about what he sees in Angel's world. When Angel comes to see him, Holtz gives Angel a letter full of warm thoughts about how he is releasing Steven to be with Angel, and how that will help Steven find his true purpose. But Holtz doesn't want to lose the boy's love after Steven embarks on a new life on Earth. After Angel leaves, Holtz has Justine create two puncture holes in his neck that look like a vampire bite. Steven finds Holtz dead and concludes it was "Angelus". Steven has a purpose now. "[Holtz] never lies in the whole episode. Even though he is completely tricking Connor into thinking Angel murdered him, everything he says is true. He realizes that Angel and Connor are destined to somehow be together; that the kid has found his way here and if that's the case, then they have some kind of destiny. He knows he has to let the kid go but the only thing he cares about is that Connor loves him. The only way to ensure this is to make sure he hates Angel. So he does what he does. He knows that Connor will end up embracing Angel, and he knows if he tries to stand in the way of that, he'll end up driving the kid there. Holtz is basically saying, 'Angel is your destiny and you will learn through Angel what it is you were truly meant to be." (Tim Minear, AtS writer/producer). Groo is a very perceptive person, but it doesn't take much perspicacity to realize what Cordelia's priorities are. Her first concern when she steps through the hotel door in the morning is Angel. Later, Cordelia sees Groo in the shadows and mistakes him for Angel (not hard, since she made him over to look like Angel). She goes on about how happy she is to see him. Groo finally raises his concerns to Lorne in pretense, trying to get Lorne's advice about what to do. Lorne tells him that things can't be forced, that they were either meant to be or not meant to be. Groo worries that his future with Cordelia was not meant to be. Destiny: Steven/Connor is a being unprecedent in (un)natural history--a human child born to two vampires. While the creation of something new and unprecedented is consistent with both mystical metaphysics and scientific evolution, it doesn't answer the question of how Steven came to be. Was Angel able to impregnate Darla with the help of the Powers that Be? Or something less benevolent? This question is intimately tied to the question of what Steven's destiny might be. Teenaged Steven's appearance on Earth is latest event in a chain of events known as "the Tro-Clon". But is he here to help bring about the ruination of humankind, or its salvation? The demon Sahjhan feared that Angel's son was destined to kill him. What Steven's actual destiny is remains to be seen. As a human with a soul, Steven can go either way--towards good or evil, but right now, he is young and traumatized and it is easy for Justine and Holtz to manipulate him. Cordelia's ascension: On her way to rendevous with Angel, the power within Cordelia once again blooms, freezing the cars on the freeway and the people inside them. Skip appears and tells Cordelia that she is a "higher being" who has now been called to fight the battle for Good in other dimensions. What does Skip mean by "higher being"? The Oracles called Angel a "lower being" until he proved that he was willing to sacrifice life as a human for a chance to save Buffy in the future. So Cordelia might be a "higher being" in the sense that she is willing to sacrifice her happiness in the present to join the battle for Good. Does that mean she belongs some place other than Earth? It doesn't in Angel's case. Nevertheless, Skip tells Cordelia she has been called to fight in other dimensions. A light forms around Cordelia's feet and lifts her into the air, presumably taking her to the other dimensions where she will fulfill her new "calling". When Steven (Connor) finds Holtz dead and hears Justine's story about how he died, he wants revenge. But Steven doesn't want to kill Angel--he is torn by both love and hatred for his biological father. He has also been raised by Holtz to seek vengeance not in the death of an enemy, but in an enemies' pain. And Holtz' letter to Steven--which seemed to turn Steven's care over to Angel--has made Angel ripe for pain. Steven returns to Angel and flatters him, saying he wants to be just like him, and asking Angel to teach him how to fight. What he really wants, however, is to know how to defeat Angel in a struggle when the time comes. Later, Angel takes Steven to the movies. A Wolfram and Hart special ops team arrives to take Steven away from Angel. Steven puts himself between Angel and the bad guys and demands to be called "Connor" instead of "Steven". But he is only protecting Angel so he can be the one to hurt Angel himself. Angel, unaware of his son's duplicity, is as happy as he's been in four years. Then he heads to the beach, where he is supposed to meet Cordelia to talk about their feelings for one another. Steven finds Angel there and subdues him with a stun-gun. Then he signals Justine, who is out to sea on a boat. Together, Steven and Justine put Angel in a coffin-like box and weld it shut. Steven tells Angel he is doing it because Angel killed Holtz, and he pays no heed to Angel's denials. Justine and Steven toss the casket into the sea. Entombed, Angel sinks to the bottom. When Groo tells Cordelia that she loves Angel, not him, Cordelia tries to make sense of his claim. Then she sees a vision of herself superimposed over her kitchen window. Her image-self says, "I know it's right". Cordelia assumes her image is talking about loving Angel, when in fact what she is seeing is a future version of herself accepting Skip's offer to ascend to other dimensions to fight evil. Why did Cordelia have this vision? Since it is in fact not about Angel, it is at least possible it was meant to mislead her. Would the Powers that Be deliberately mislead their vision-girl? To what end? And should Cordelia have accepted Skip's offer? The last time Skip came to her, he told her that being an actress was her "true" destiny, and he manipulated her into accepting it by showing her Angel in a moment of frustration calling her a "weak Sunnydale rich-girl". This time, Skip tells Cordelia that she's a great warrior who has outgrown this dimension with the wise use of her new powers. Now granted, Cordelia is a brave woman and she chose to live with very painful visions (prior to being made part demon), but she doesn't have full voluntary control over her powers that Skip's flattery implies she has. And Cordelia hesitates to take Skip's offer. She wants to be able to tell Angel how she feels, and resents having to go with Skip before she can do this. Then she realizes that this is a test. But what is the correct response? She believes she has to accept Skip's offer on Skip's terms (without seeing Angel first), or fail the test. Meanwhile, the man her visions are meant to guide is sinking into a literal abyss, and an abandoned friend is sinking into an emotional abyss. Cordelia decides that the life she is leaving behind will somehow come out all right without her, and she is elevated away. Wesley: Finding out that Connor is alive hasn't brought Wesley out of his funk or inspired him to try to reconcile with his former friends. He's only sunk further into bitterness. And Lilah's relentless visits aren't helping. The manipulative Lilah taunts Wesley with the possibilities: is Angel's son here for good or ill? What might Wesley's knowledge of books and magics do to help bring about the best outcome? And how will he succeed in helping if his former friends won't bring him back into the fold? Lilah's motives with Wesley are obvious, even to him, but this time she turns her seduction-to-evil into a sexual seduction. Wesley channels his bitterness and rage into sexual passion, and when they're done, coldly kicks Lilah out (although she isn't hurt much by the sudden rejection). He may be trying to keep an emotional distance from her manipulations with his aloofness, but by becoming intimate with her, he isn't succeeding. Lorne hasn't had much chance lately to do what he does best--belting out a song and reading the destinies/souls of people who come to sing for him. And he doesn't think he'll have much luck pursuing his gifts with the Angel Investigations team around his workplace. So he's accepted a job offer in Las Vegas. He also admits that things are uncomfortable with teenaged Steven having the big hate for demons, including the ones that love him. Before Lorne leaves, though, he gives Angel two gifts--a CD collection of his songs, and the news that Cordelia has feelings for Angel, too. Angel: the Series copyright © 2002 The WB Television Network.